Product prices and availability are accurate as of 2019-04-23 05:43:38 UTC and are subject to change. Any price and availability information displayed on http://www.amazon.com/ at the time of purchase will apply to the purchase of this product. Stainless steel case with a stainless steel bracelet. Fixed stainless steel bezel set with 40 brilliant-cut diamonds (0.71 ct). Silver Grande Tapisserie dial with silver-tone hands and stick hour markers. Dial Type: Analog. Luminescent hands and markers. Date display appears at the 3 o'clock position. Quartz movement. Scratch resistant sapphire crystal. Solid case back. Case diameter: 33 mm. Case thickness: 9 mm. Octagonal case shape. Deployment clasp with push button. Water resistant at 50 meters / 165 feet. Functions: date, hour, minute, second. Luxury watch style. Watch label: Swiss Made. 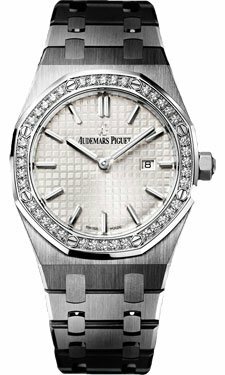 Audemars Piguet Royal Oak Diamond Silver Dial Stainless Steel Ladies Watch 67651ST.ZZ.1261ST.01.